The online catalogue is updated annually. The database shows potential customers whether the MFA has already made a microfilm copy of a particular newspaper. It also lists institutions where microfilm readers are available and where users may place orders via interlibrary loan. 12 updates of the printed catalogue have been issued since 1967. 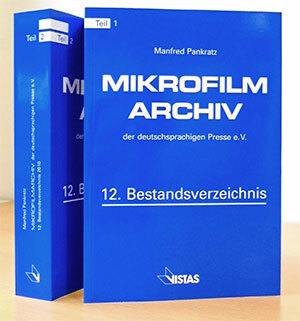 The current 12th edition was compiled by Manfred Pankratz and is published by Vista Verlag, Berlin. It contains 11,000 entries and is available for purchase at bookstores.